Of course it is right by my door. An Eastern Cicada Killer wasp has just dug her burrow between the paving slabs by the front step. 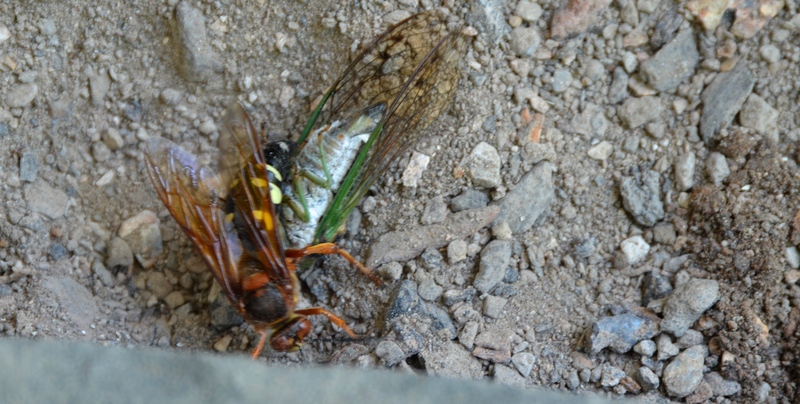 The female Cicada Killer is aptly named as she catches and stuns a Cicada, and carries it back to the nest. The wasp then drags the Cicada underground, into the burrow, and lays an egg into it. In the cycle of life, the young wasp egg hatches and uses the cicada as food. There is no need for humans to be worried about these wasps as they are not aggressive, they just look big and stripy. The female is busy with her nest, and the males, although they sometimes cluster together, do not have a stinger. If you have never heard a Cicada, the males are very noisy. They sit up in the trees and call for a mate. The females are the ones that damage the thin branches of trees. They make a slit in the bark and lay eggs into the tissue of the tree. The end of the branch dies and the leaves will often turn brown. To the gardener, the brown leaves at the end of branches are an obvious indication of Cicada damage. This symptom on trees is called flagging. In most years it is not too big a problem, apart from when the periodic Cicadas emerge from the ground every 17 years, and then there are not enough predators to eat even a small proportion of them. It is a great reason to leave the Cicada Killers to their own burrowing and nest making, because in the years when Cicadas are everywhere, the Cicada Killers will be very busy, and you will be happy that they are there. Snowy garden on March 21st! Wasn’t I meant to be planting peas?